The new masterpiece of the "golden series" in the product line of "Khortytsya" spirits was created thanks to great competence of the distillers and inspiration of the specialists from the company DANCO DECOR working on decoration of glass containers. White is the color of awakening, the birth of something new, beautiful, graceful and weightless. White is the color of a clean canvas on which the artist creates his performing. Nature in the moment of the birth of year covers the earth with a white snow blanket covering sprouts of new life which soon will turn into blossoming beautiful creations. In the freezing winter of 2018, Khortytsya also presented to the world its new product - vodka "White & Gold" from the popular "gold collection". Khortytsya White & Gold - is vodka of premium quality, the embodiment of style and freshness. The manufacturer, strictly controlling the quality of the used raw materials, chooses only wheat grains which are grown in ecologically clean areas. This is why they manage to get grain alcohol of the new generation "Wheat Tear" which is featured with its unique purity and softness. The spring water used in the process of production is extracted from the springs located at the depth of about 150 meters. The distinctive feature of White & Gold is a completely new recipe containing aromatic cumin and anise alcohols. Inclusion of new ingredients in combination with sugar gives the drink a refined noble aroma and softens its taste. The company DANCO DÉCOR, the expert in decoration of glass containers, created a perfect matt covering for the new beverage packaging. This art solution was made in the context of noble laconism chosen for the collection. Elegant simplicity of forms and purity of snow-white color harmoniously underline all advantages of the contents of bottle. The only emphasis is placed on the name of the drink, printed in gold as confirmation of its high quality. The technologists of DANCO DECOR chose the method of coating with white matt paint. This technology presumes spraying of a lacquer with an electrostatic atomizer on glass surface. Before decoration of a glass container, a special cleaning procedure is carried out, which ensures a high level of adhesion of a dye on glass. After that bottles are moved to the automatic line, where color coating is applied. Since the company uses the most modern equipment of leading European manufacturers, glass containers pass the stages of pre-treatment, painting and following drying occur in a single cycle. The cured decorative surface becomes highly resistant to all kinds of damages. This method allows to combine coating with following application of screen-printing or hot stamping. 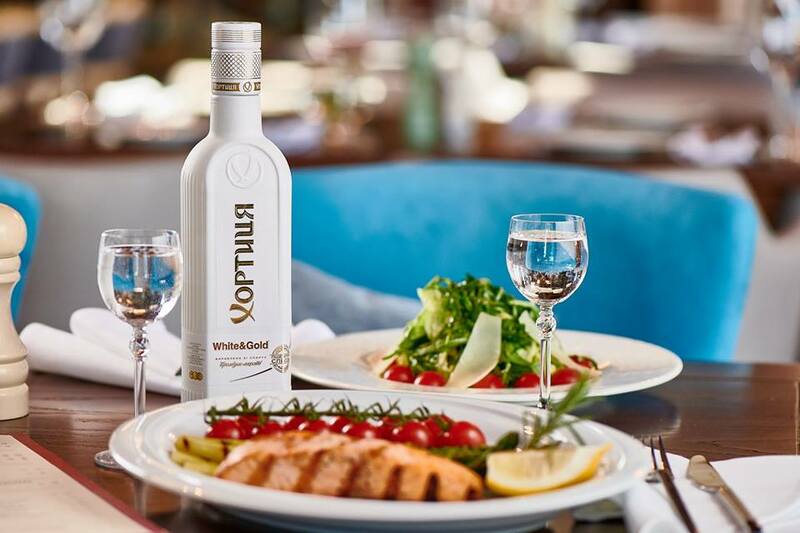 Khortytsya White & Gold - a harmonious combination of soft light taste with purity and noble elegance of the bottle.